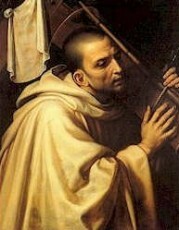 St. Bernard of Clairvaux was born in 1090, and was a French Abbot, and the primary builder of the reforming Cistercian Order. St. Bernard sought admission into the Cistercian order after the death of his mother. Three years later he was sent to found a new abbey in an isolated area. According to tradition, Bernard founded the monastery in June of 1115, naming it Claire Vallee, which evolved into Clairvaux. It was there at Clairvaux that Bernard would preach an immediate faith, in which the intercessor was the Virgin Mary. In 1128, he assisted at the Council of Troyes, at which he traced the outlines of the Rule of the Knights Templar, who soon became the ideal of Christian nobility. On the death of Pope Honorius II, a schism broke out in the Church. St. Bernard was chosen to judge between the two rivals for Pope, Anacletus II, and Innocent II. He did all he could to convince Kings and Countries leaders, but the whole conflict did not end until 1138 when Anacletus II died. In 1139, Bernard assisted at the Second Council of the Lateran. St. Bernard denounced the teachings of Peter Aberlard to the pope, who called a Council at Sens in 1141 to settle the matter. Bernard soon saw one of his disciples, Bernard of Pisa, elected Pope. Because St. Bernard had previously helped end the schism within the Church, he was now called upon to combat heresy. In June 1145, Bernard traveled in southern France and his preaching there helped strengthened support against heresy. The last years of Bernard’s life were saddened by the failure of the crusaders; the entire responsibility was thrown upon him. He died at the age of 63, after 40 years spent in the cloister. He was the first Cistercian monk placed on the Calendar of Saints, and was canonized by Pope Alexander III, in January 1174. In 1830, Pope Pius VIII bestowed upon Bernard the title, “Doctor of the Church”. St. Bernard was buried at the Clairvaux Abbey, but after its dissolution in 1792 by the French Revolutionary Government, his remains were transferred to the Troyes Cathedral. He is fondly remember as the “Honey-Sweet” voiced Doctor of the Church for his eloquence. St. Bernard spent his life in service to the Church. He served her well – mediating as “judge” at times, between two groups as a schism in the Church took place. He founded a Cistercian Monastery in Clairvaux. He also taught that we could rely on the intercession of the Blessed Virgin Mary. He assisted at several Councils in the Roman Church, always being respected for his deep faith, and eloquent speech. He was so good at preaching, he used it as a means to avoid heresy that was also rampant in his day. He truly, worked in heroic ways to end the schism that took place in the church of his time. We can learn a lot from St. Bernard – his profound love for the Blessed Mother, and his defending the faith at all costs. We too, would be well rewarded if we would follow his example, and defend the faith in our society today.